What is usually a dreaded Monday morning inbox was today brightened by an invitation (below) from Samsung to see “the next Galaxy” unveiled in Berlin on September 4. Though the invitation doesn’t specify which flavor of Galaxy we’ll see, we’re all expecting to get our hands on the Galaxy Note III for the first time. 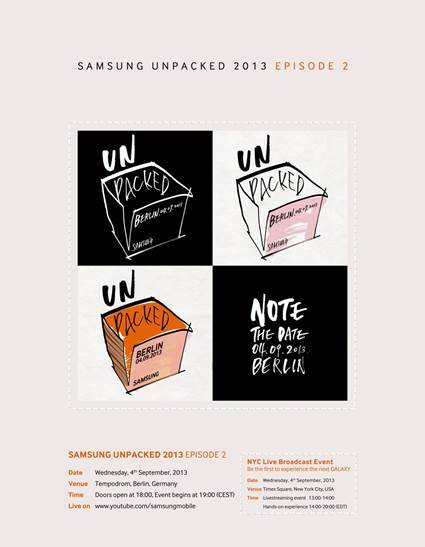 As per Samsung tradition, the company is calling the event “Samsung Unpacked” because why fix something that isn’t broken? Last year, Samsung used the IFA conference to showcase the Galaxy Note II for the first time ever. The September 4th unveiling for the next Galaxy falls just before IFA Berlin this year, which begins on September 6. That said, it’s entirely possible that Samsung will be setting up an independent press conference to unveil the next-generation of the Galaxy Note while leveraging the inordinate amount of tech press in Berlin at the time. Ina Fried notes that the invitation is hand-drawn/written, which does lend itself to the Galaxy Note’s standout characteristic, a Wacom-style S-Pen stylus. Rumors about the forthcoming Galaxy Note III have been all over the place — we’ve heard it will have up to a 6.3-inch screen, and later heard there will be four different variants with different screen sizes — but there’s one thing that seems to match up across all the sources on the web: the date. Most tech pundits believe that Samsung is due for another Galaxy Note III around the time of IFA in Berlin, which follows suit from last year. Other than that, we really don’t know what we’ll see come September 4. We’ve heard about flexible displays, metal chassis, and multiple versions, but only time will tell what Samsung has in store. As usual, we’ll be there bringing you live coverage of the event as the story unfolds.